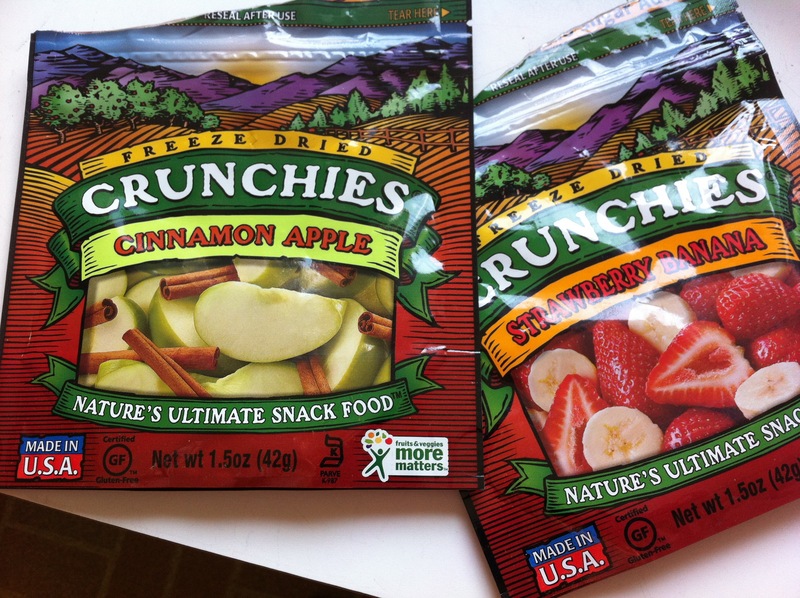 Above is a very recent find: Freeze Dried Crunchies! One and two ingredients snacks with a bit of sweetness… no ingredients save the fruit and (in the case of cinnamon apple) cinnamon. Our family unanimously agreed that the Cinnamon Apple are by far the best. We found them at GNC in the mall, of all places. 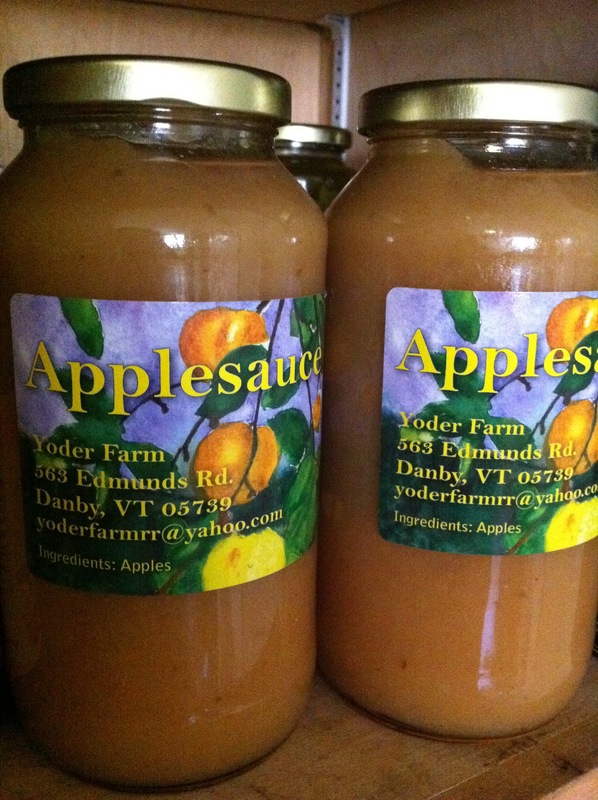 My most recent Farmers Market discovery: apple-only applesauce! Who would’ve thought No Sugar applesauce would be SO hard to find? (remember: added fruit juice counts as added sugar!) Ryan and Rachel Yoder make this pretty sauce and sell it alongside their homegrown dried beans and popcorn at the Dorset Sunday market. Dried fruit is very tricky since so much of it has added sugar- try finding dried cranberries without added sugar and you’ll see what I mean. However, you can find it, often at the local health food store. 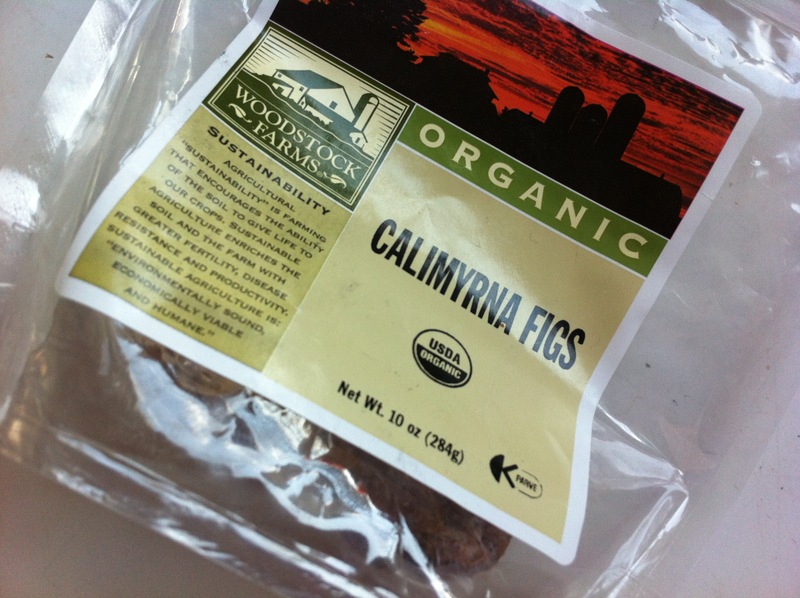 I recently tried these Calimyrna Figs and realized they tasted just like …. what? Fig Newtons, of course! We’re lucky to have friends who let us get in on a bulk organic produce order once a month or so. It’s truly amazing how much more produce you’ll consume when you know you have a ready supply on hand. We fill up our fridge with organic apples, oranges and pears (above) and store the overflow in our basement at about 55 degrees. Aluminum cans with holes drilled for airflow keep them fairly well. Any extra fruit I worry might be going bad (such as these pears above) gets dried into fruit chips on the dehydrate setting in my oven. 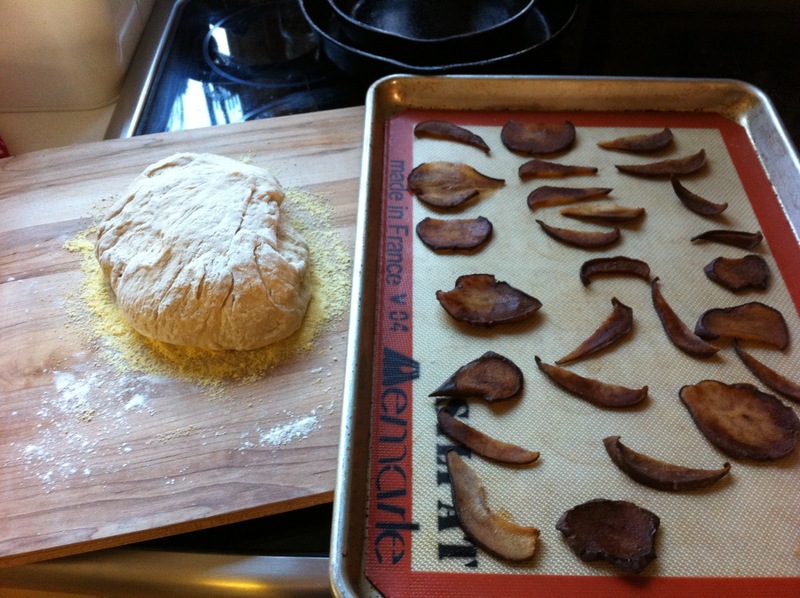 As I mentioned, it takes forever, and means the oven isn’t free for quite a while, so perhaps a separate dehydrator appliance is in our future someday… They never make quite as much as you think, and they never last long- but aren’t they pretty? 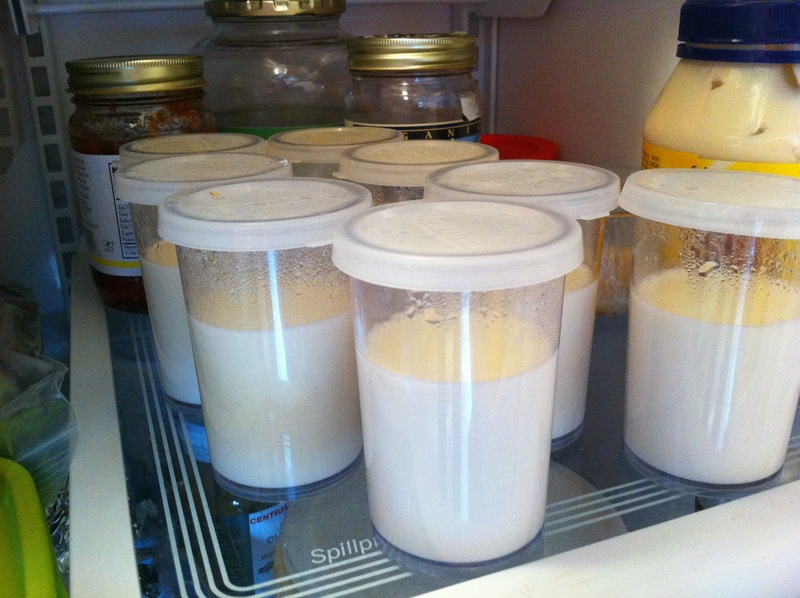 Homemade yogurt isn’t as much of a pain as you might imagine- just heat on stove or in microwave, add starter (a heaping spoonful of existing yogurt), and (if you have a nifty Donvier machine like we do) put in the cooker for a good 16 or 17 hours to cook. After that cool in the fridge for 3 hours. Voila! This fridge shot is a rare sight- this stuff disappears in our house like you wouldn’t believe. I’m curious about your thoughts on fruit. I spent my first month of no sugar eating a lot of whole fruit as you do. Then I decided that fructose is fructose and a lot of fruit is probably not very healthy. Now I limit myself to one piece of fruit a day and I totally avoid dried fruit. I make lightly dextrose sweetened treats to satisfy our desire for sweets rather than eating a lot of fruit or fruit sweetened treats. A piece of fruit a day is a good rule, I think. David Gillespie talks about having “one or two” pieces of fruit per day. Between things like sauce, dried or freeze-dried and fresh, I would estimate that’s around what we each have in our house- one or two, give or take. I try to have plenty of variety of everything on hand, so we don’t get “apple-fatigue,” as it were. If it looks like there is a lot of fruit in our house you must remember- there are four of us! 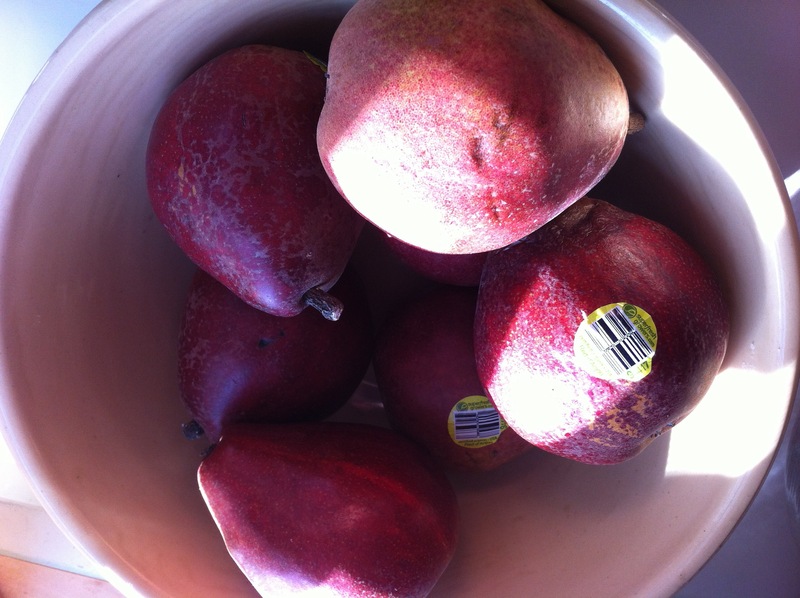 Even at one-two pieces per person per day, you can go through a big bowl or bag of fruit pretty fast. Interestingly, I have recently rediscovered a passage in Sweet Poison in which David Gillespie talks about the fact that “small amounts of fructose appear to be a sort of starter motor for our glucose digestion in the liver.” So a small amount of fruit can be a good thing. 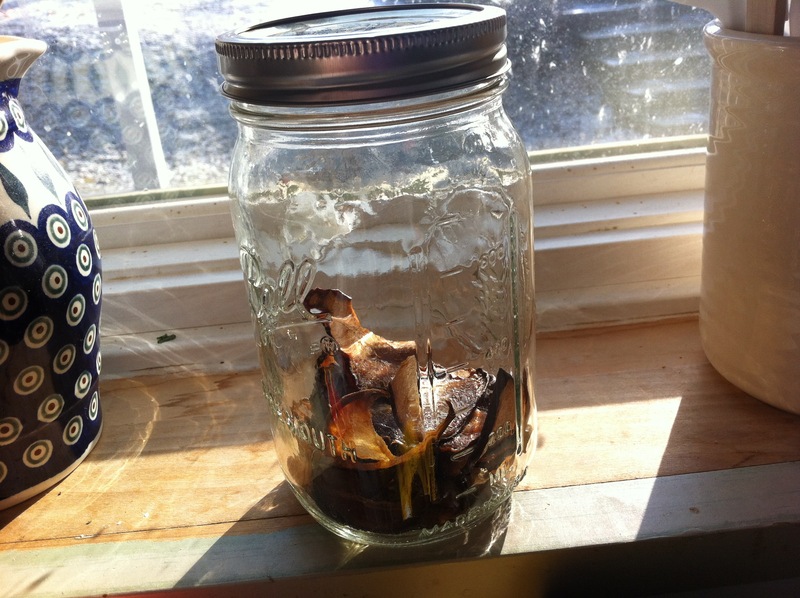 Dried fruit is, of course, concentrated and should be consumed in extreme moderation, but is a nice way to use up produce which would otherwise be wasted. Yes, I agree with Lisa, David Gillespie says that dried fruit is extremely concentrated fructose. Wouldn’t this be one of the reasons you found your year of no sugar so difficult? Fructose is very addictive and would increase your sugar cravings. I was puzzled as to why you found it so difficult. Like Lisa, I don’t eat much fruit at all, even less, actually and have, after 14 months lost the taste for sweetness. Every now and again, if we have guests, I make a dextrose sweet to have for desert and don’t have a lot of it, or even the sweetness of the dextrose will set up a temporary craving for sugar. In the hunter, gatherer days, when fruit was hard to find and was seasonal, man fed himself and his cattle fruit, in the Fall to fatten himself and his cattle for the long winter ahead. Apparently, our bodies haven’t changed in their needs since then. I don’t know- maybe I talked more about craving sugar than I thought, but I’ve thought for a while now- and tried to write about the fact- that the far-and-away hardest part of not eating sugar for our family was the social element: not being able to join in on SO many occasions in our community. Sure, there are cravings, but often enough they are complicated things, as mixed up with emotion, nostalgia and memory as with biology. When I crave s’mores, am I craving marshmellows and chocolate, or am I craving my childhood? As I mentioned in my responding comment above, although it looks like a lot of fruit in these pictures, I wouldn’t say we eat any more than the equivalent of a piece or two each per day. The nice thing is that we have a variety of snacks around the house and for putting in our school lunches. I’m delighted that my kids ask for a banana or an orange for a snack- and are genuinely happy with it- while most of their friends are having cookies. Anyway, if I came off as whiny in my posts I regret that- my intention has always been to try to chronicle our journey as accurately as possible so people might be able to see what is really involved in trying to live without sugar… is it hard? yes. Impossible? No. Not related to this post but… There is sugar/fructose talk on NPR Science Friday! I am still waiting to hear who the speaker is. I didn’t catch the beginning. Very exciting that they chose this topic! Oooooo! Thank you Rachel- I will definitely have to check this out! It turned out to be Dr. Lustig, of course! 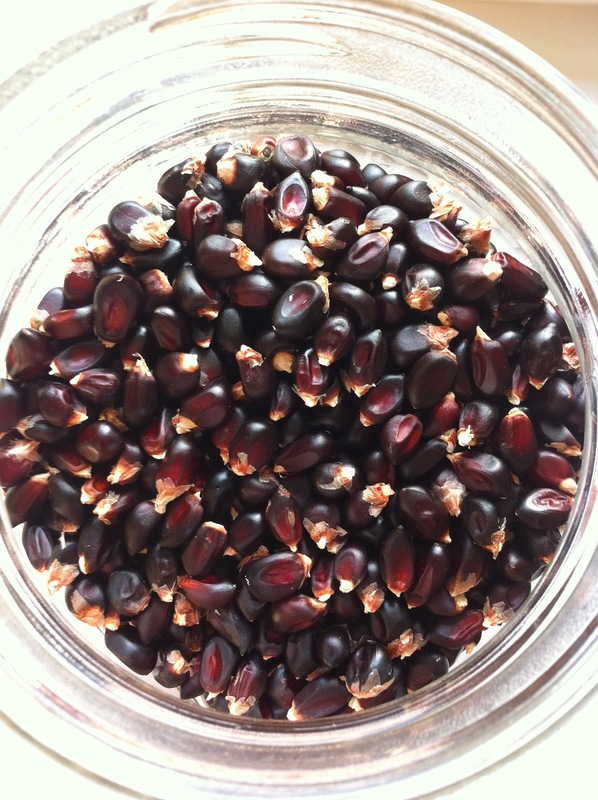 You are currently reading A Year Of No Sugar: Postscript 5 at Eve O. Schaub.